The Review: Slaughterfest takes place in a seaside town. First Duke must make his way from the beach to the streets, then find the Queen and kill her. The map is actually a bit like Anarchy City X, only with guns. The opening track of the Rise of the Triad shareware episode sets the tone, a tone that implies there's no time to rest but to gear up and shoot things. In Slaughterfest weapons and other items are earned. To be sure, there's enough ammo lying around but getting to it isn't always an easy task. While I'm usually not a fan of filling maps with tons of monsters, here it seemed to fit and I didn't find myself wondering "will it ever stop" until a few minutes before the end. 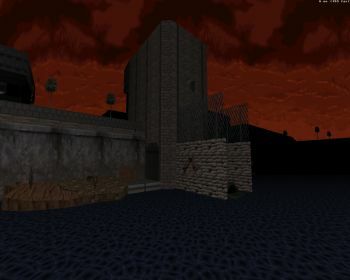 This is probably because the map always felt more challenging and high-adrenaline than boring: boring is what you usually end up with when you superficially increase the monster count (which is a big reason why I don't play Doom usermaps that often). The final battle suffers from some shortcomings, or least it seemed to when I played the map: the boss got stuck behind a blocked wall and while you could still shoot at it with the aid of a jetpack, this was a slightly tedious way to end an otherwise fun map. Design is good and functional (considering the map's challenges), not really eye-catching but still above average, and the seaside theme is something that always tends to provide a pleasant sense of openness even when you're squeezing through narrow alleys. That being said, Mister Sinister could probably use a change of environment because his city-themed maps are getting slightly repetitive in terms of design. 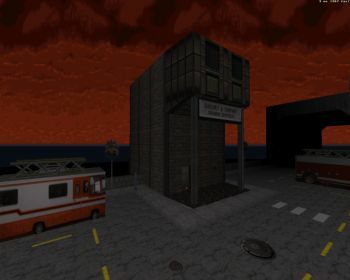 Conclusion: Slaughterfest is a pretty good map to test your skills, featuring tons of enemies in varied surroundings with aliens chasing Duke from beaches to rooftops. The pacing, combined with the classic audio track, makes it feel as if the map is breathing down your neck.